Mazda is set to challenge Aston Martin, Porsche, Lotus, and BMW on the race track with its lightweight Mazda MX-5 GT entry in the Britcar MSA British Endurance Championship 2011. Weighing in at just 850kg, the Mazda MX-5 GT race car will accelerate from 0-to-60mph in just three seconds and hit a top speed of 160mph. The build of the car has been an engineering challenge to get the weight as low as possible using Mazda’s gram strategy as the inspiration. Jota Sport examined every nut and bolt to reduce component weight and then match the power to the weight to give the lightest and most powerful MX-5 ever built. An important aspect of the build was to ensure the Mazda MX-5 still remains true to its roots: great handling, huge fun-to-drive and the ability to challenge bigger more powerful competition, but at an affordable cost. The Mazda GT car ticks all those boxes and is now set to demonstrate its challenger spirit on the track. Jota Sport, the race engineering team that will run the cars in the 2011 series, took 400 hours to build the shell to a specification that ensured it was 17 times stronger than required by the FIA. During the development they faced a number of engineering challenges such as suspension adjustments, integrating the six speed sequential gearbox, and lowering the engine. Weight saving strategies such as, the removal of interior components, reducing component weight and dipping the shell in acid lost 15kg from the MX-5 race car. The completed MX-5 GT features a modified Mazda engine to produce 275bhp, a six speed sequential paddle shift gearbox, carbon doors and Polycarbonate windows. 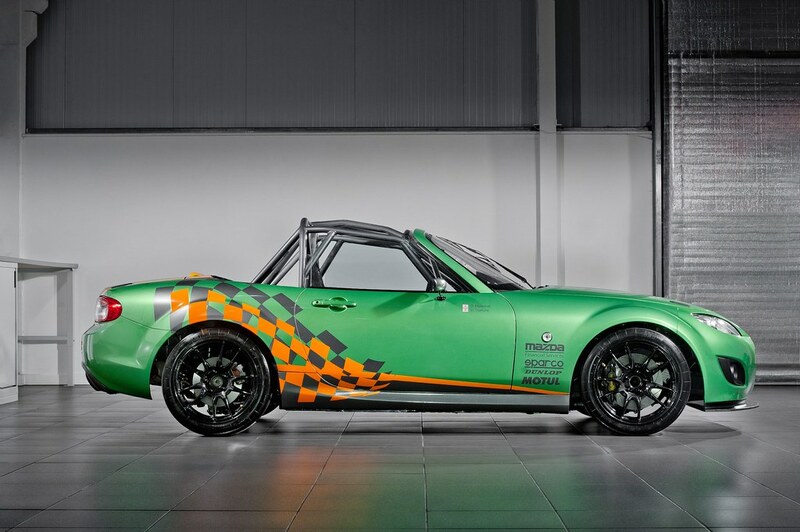 On the exterior, the Mazda MX-5 GT boasts a Spirited Green metallic body colour - a first on the MX-5 for Mazda UK - complimented by Jota Sport corporate coloured liveries in orange and grey. Mazda is renowned for challenging conventions so the motivation to develop a MX-5 GT car comes naturally. It also comes at a time when Mazda has recently celebrated a number of milestones for MX-5 including its 21st anniversary and producing 900,000 MX-5 units globally since its introduction in 1989, with over 10 percent of global MX-5 sales from Britain. Meanwhile, the Mazda MX-5 continues to hold the Guinness World Record as the world’s best-selling roadster – testament to its continued popularity with British open top sports car fans. The Britcar MSA British Endurance Championship is contested over nine races from March to November including a race at the Spa Francorchamps circuit in Belgium. The first race is a three hour endurance race at Silverstone next weekend, Saturday 26 March 2011, starting at 3.00pm. This is the fourth time that Mazda has entered Britcar and this year the Mazda MX-5 GT car will be driven by two Mazda works drivers including experienced Mazda racing driver Mark Ticehurst, 39 from Hassocks, West Sussex and Auto Express journalist and racing driver Owen Mildenhall. 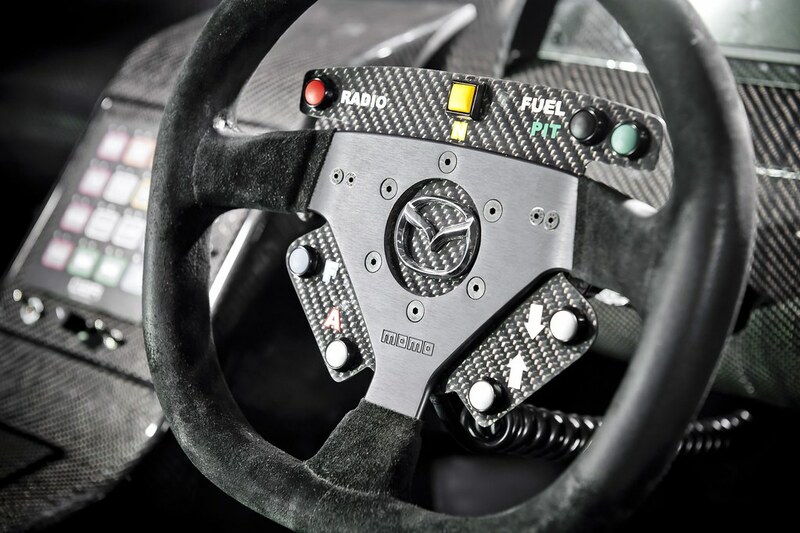 “The MX-5 production race car’s modest power output, bullet proof reliability and nimble handling demonstrated last year how the MX-5 can be competitive against some of the purpose-built Lotus, VW and BMW race cars. With a higher power output combined with the durability, reliability and handling attributes that the MX-5 is renowned for; the MX-5 GT race car will be strong contender against the more powerful race cars in its class,” comments Graeme Fudge, PR Director, Mazda UK. 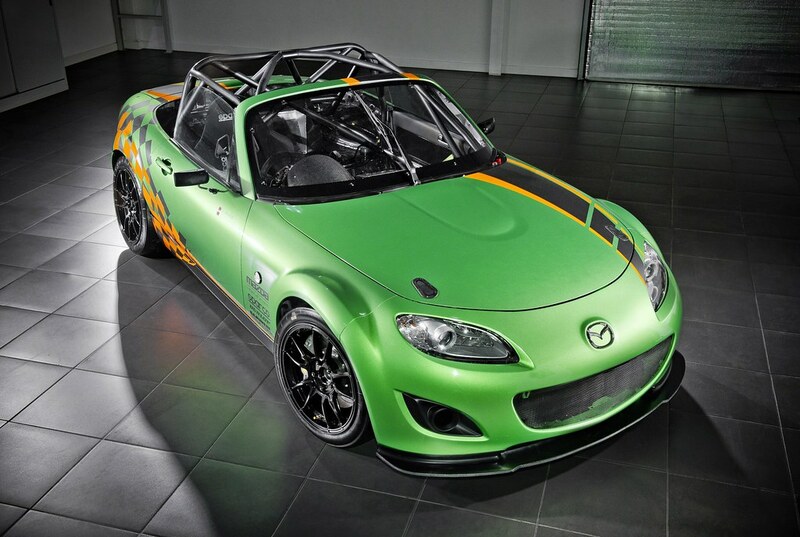 The Mazda MX-5 GT car, prepared by Tunbridge Wells-based Jota Sport features the mandatory FIA approved safety equipment including a roll cage, race seats and harness, external electric cut-off and fire extinguisher, safety catches on the bonnet and boot lids, competition steering wheel and alloy wheels, while the running gear, rear axle, gearbox and engine have been modified to enhance performance.